Genomic Health said today its Oncotype DX Genomic Prostate Score (GPS) test will be evaluated for the prostate cancer drug pipeline of Johnson & Johnson’s Janssen Pharmaceuticals through a research collaboration whose value was not disclosed. Under the collaboration, Genomic Health has agreed to test samples from Janssen studies while the drug developer agreed to the use of GPS for the evaluation, with the goal of examining the association of GPS results with clinical outcomes. “Janssen is a recognized leader in oncology, and their selection of the Oncotype DX GPS test reflects the best-in-class value that it delivers in stratifying patient risk and may reveal potential for guiding treatment selection for prostate cancer patients in the future,” Phil Febbo, M.D., Genomic Health's CMO, said in a statement. Oncotype DX GPS is designed to help professionals assess clinical risk and tumor aggressiveness, in order to decide whether immediate treatment is necessary, or opt instead for active surveillance. According to Genomic Health, the GPS assay is the only genomic assay designed for men with clinically low-risk cancer to help make treatment decisions at the time of diagnosis. GPS is designed to examines interactions among genes in the tumor in clinically low-risk prostate cancer patients (GS 3+3 and 3+4). The test, developed based on multiple studies with Cleveland Clinic, provides a result (GPS) ranging from 0–100 that corresponds to the biologic aggressiveness of the tumor, and measures biology through the expression of 17 genes across four important genetic pathways and—in conjunction with clinical risk factors—predicts the likelihood of adverse pathology. Janssen’s prostate cancer drug pipeline is led by two candidates that are awaiting FDA review. On September 14, Janssen said it filed a supplemental NDA seeking approval to expand the indications for its marketed cancer drug Zytiga (abiraterone acetate) in combination with prednisone and androgen deprivation therapy (ADT) for patients with high-risk metastatic hormone-naïve prostate cancer (HNPC) or newly diagnosed, high-risk metastatic hormone-sensitive prostate cancer (HSPC). The following month, Janssen filed an NDA for apalutamide (ARN-509), a next-generation oral androgen receptor inhibitor for men with non-metastatic castration-resistant prostate cancer (CRPC)—which would, if approved, be the first treatment indicated for non-metastatic cancer-resistant prostate cancer to reach the market. 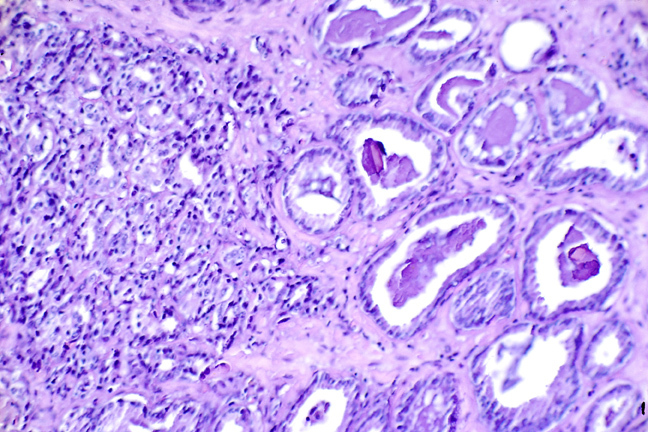 Apalutamide is also in Phase III development for metastatic hormone sensitive prostate cancer, for localized prostate cancer—and as part of a combination for chemotherapy-naïve patients with metastatic CRPC. According to Janssen, it plans to file for FDA approval of Zejula (niraparib) for metastatic CRPC between this year and 2021. Janssen holds exclusive worldwide-except-Japan rights granted by Tesaro to develop Zejula in prostate cancer, through an up-to-$450 million collaboration launched last year. Separately, Genomic Health disclosed that it made a $4 million equity investment in Biocartis, with which it is developing an in vitro diagnostic (IVD) version of the Oncotype DX Breast Recurrence Score test. That test is designed to quantify the risk of distant recurrence and the likelihood of chemotherapy benefit in patients with early stage, ER-positive, HER2-negative, node-negative, and node-positive (1–3) breast cancer. Oncotype DX Breast Recurrence Score would be developed for use on Biocartis’ Idylla platform, for use domestically by laboratory partners as well as in hospitals worldwide, Genomic Health said.